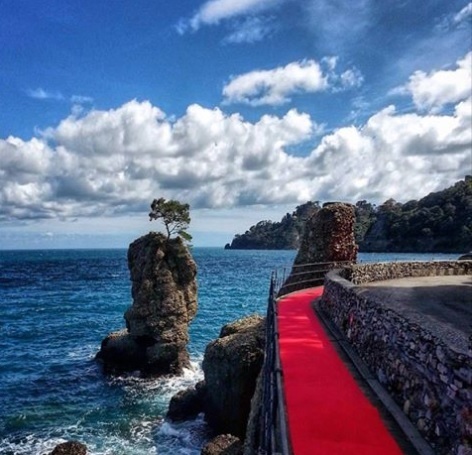 23/05/2017 - On April 29th, on the occasion of the inauguration of the new sidewalk along the road that connects Rapallo to Santa Margherita Ligure, a new world-record was set: the longest red carpet in the world, for over than 8 km. The occasion allowed to discover a truly extraordinary walk, starting from the ancient castle of Rapallo, passing through Santa Margherita Ligure, it arrives in Portofino, crossing a spectacular stretch of Ligurian coast with fantastic views over the Tigullio Gulf. Lot of people, together with the President of Liguria Region, local authorities and some sporting champions, participated in the inauguration day, and at one month apart people who walk along the red carpet are still numerous, having the opportunity to discover a fantastic route that touches internationally renowned resorts. The Red carpet way crosses beautiful coves and goes forward into the lush Mediterranean scrub along the so called "Sentiero dei Baci" (lit. : Path of the Kisses) that from Paraggi leads to Portofino, final destination of the walk. The mayors of Rapallo, Santa Margherita Ligure and Portofino recently announced that the Red Carpet will be certainly maintained until the end of summer 2017. The initiative, greeted with enthusiasm by all the participants, had a great media coverage, proposing this wonderful walk as a viable alternative to the famous paths of the Cinque Terre. Liguria never ceases to amaze.